Law enforcement and military personnel have used training simulators for years, but now schools will begin using the same technology to prepare for mass shootings. The US Army is working with the University of Central Florida to develop a computer-based simulator tailored for teachers and other educators, the Associated Press reported this week. Simulations will allow school administrators to test a variety of responses to determine the most effective survival strategies for their teachers in any given situation. “They can do some analysis in the engine and say ‘what would happen if I did have externally locking doors? Or, automatically locking doors. Or what would happen if I add intercoms, how would that change the survivability of this situation?’ So, it allows you to do analysis also,” project manager Bob Walker told the AP. “A lot of these features allow teachers to test out things that have been tried. For example, at Virginia Tech they found barricading the doors worked very well. 3D sound enables the user to determine the direction that the shots are coming from, and users can also view several perspectives, including a teacher, a police officer, pupils, and the shooter. Based on this information, the trainee can choose a variety of commands to direct their students to safety. The AP report does not indicate whether the simulator can be tailored for teachers with concealed weapons, but its ability to depict the perspective of a police officer, and its basis on law enforcement simulations, suggests that it could be modified for use by armed teachers. 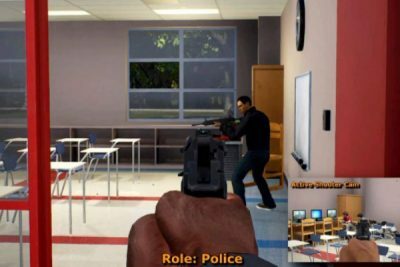 Researchers studied actual school shootings in detail to make the simulations as accurate as possible. Everything from the screams of the victims to the weaponry of the shooter is based on the mass murders at places like Columbine and Sandy Hook. “Suspects come with rifles. Suspects can be adults or children. Unfortunately, that’s the reality of today’s society. We have to worry about children and adults being suspects,” Walker said. The Army Research Lab plans to make the training available to schools free of charge. One thing I hope they might learn from this training is the reality of the situation, of being in that environment will suddenly awaken them to the futility of being unarmed in that situation. If they don’t begin to realize that reality, and sometimes I don’t think they are capable of realizing it. They will rely on false training with the belief that it will save them. Lining them up against the wall will merely save the perp some time and effort and provide more targets of opportunity. Duh. This is insane. It just tells parents that the adults running the school and the society are incapable of protecting their children. With this kind of systematized insanity infecting our “gun free” public schools, it makes home-schooling a compelling option. In today’s world, we should never leave our children with unarmed adults who cannot protect them. Are there going to be any simulators for the armed security staff that should now be in place in every school?